A little after three this morning, I heard a cat. Not just any old cat but a pissed off cat. (Potty words aren't my favorite but I'm a believer they are just words. Used here to convey to you what the cat sounded like.) I laid there and listened for a while trying to convince myself it wasn't Bandit in the house hurt or stressed. I couldn't do it and I stumbled out of bed, causing the dog to give a sleepy "bruhh." I make it to the living room and realize the rabbit is uncovered, the aquariums need water so even if a cat was crying I'd never hear it. I squinted my eyes, we all know that helps you see in the dark, and I saw a black blob at the end of the hall. I was satisfied that Bandit was sleeping in the hall and I must have been dreaming. I fell back into bed and for the next 30 minutes the dog was whine-purring in her kennel because I disturbed her and surely as the night is long I could hear the faint screeches off and on of a pissed off cat outside! As I lay there begging for sleep to return I felt the paragraph above began to form. Now why in the world would I feel led to share with you my middle of the night cat tales??? I laid there whispering to myself and God prayers from my Wednesday night girls, from church on Sunday, from Facebook friends and family. Eventually I drifted back off somewhere between a prayer and amen. It seems my last few blogs have had a similar weaving-mercy, compassion, mental health. 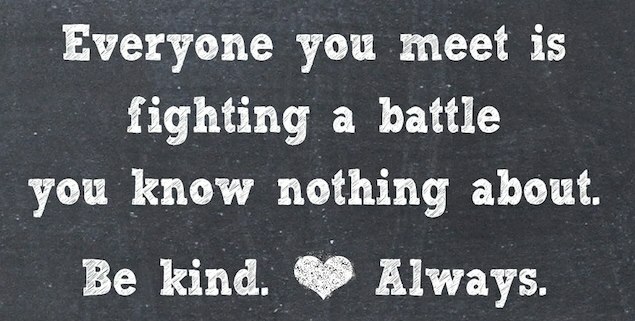 Let's face it, mercy and compassion go hand in hand with mental health. When I woke this morning and opened Facebook I was confronted with a status complete with pictures, when I saw the pictures I smiled because it was a familiar face of a warm, loving individual. When I read the post, my stomach lurched because it was news that the familiar face is gone. His life cut short because the dark places took over the joy and light. I share this not for personal sympathy because my sadness is nothing compared to his family, his tribe and those who loved him deeply. I share today because that damn cat story. It's not about a cat at all. It's about listening deeply and acting-mercy and compassion. Last night I had an awesome devotion activity planned, my girls decided we should wait because we were missing three "usuals." So I quickly shifted gears and we talked about Lent, they all shared things they'd given up-chocolate, candy, etc. I encouraged them to reflect back to Valentine's Day when I shared my blog I'd written for them and we decided we all needed to "take on" more mercy and compassion for the remainder of Lent. I learned they all ride the bus. I'm not a bus driver but I can imagine it's a special calling to be responsible for a bus load of children, transporting them safely at least twice per day. I encouraged them to at least once a week for the next four weeks to SEE their bus driver and say a thank you for getting me to school/home safely. It's not just the bus driver it's the kid in the hall who gets picked on or worse yet goes through their days unnoticed and unspoken to by their peers. It's the person teetering on the edge of dark who needs a ray of light to help them see their worth and keep them from slipping over the edge. I can't count the times someone comes to my heart and I whisper a prayer. Sometimes I feel a particular tugging to send them a text, call them or write a quick note to drop in the mail. Usually I listen, last time I didn't. Now, it's too late. 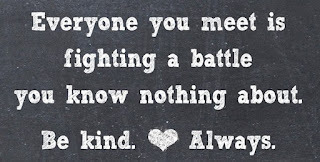 I know I've shared this saying before but it is so worth repeating. Yesterday evening, I had planned to attend a class on prayer at FUMC. I had talked to the leader and he said it was fine for me to join late. I walked to the room ready to go in and I couldn't. I was paralyzed with fear, I could see him through the windows of the Gathering Room, talking with the participants who were eagerly listening and learning. I couldn't bring myself to interrupt and walk in. I quickly turned and went to my car where I began reading his book. 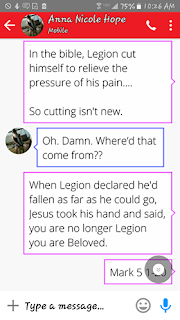 I have to admit, I skipped to the 2.28 devotion and devoured it. I then continued on to read the introduction for week 3. 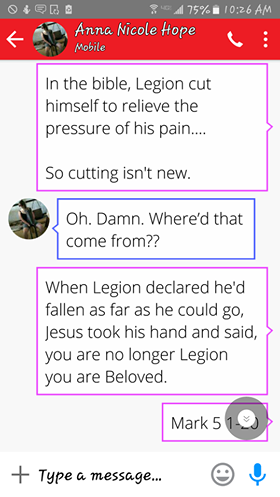 I've heard the story of Legion many, many times...below is the text conversation with my Anna because I had to share the perspective I'd read. From "An Audience of One" by Rev. Eric Meyer "When Jesus met Legion, Legion had allowed his demons to become his identity." Today I encourage you, send that text, make that call, write that letter when your heart is tugged. Let the love of Jesus shine through your actions, perhaps your light can help turn a Legion back into a Beloved. ~shalom Beloved!